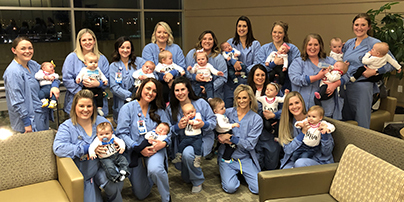 Out of the 5,026 babies born at Methodist Women's Hospital in 2018, 17 share a special bond. That's because their mothers share the same job -- working as labor and delivery nurses. "We're all going through the same stages in life," said Teresa Minarich, a labor and delivery nurse. "I feel like a lot of us, we're the first ones we tell each other when we're pregnant -- even before our families, just because we work in this. We're around each other all the time, 12 hours a day." Among the group of babies, there are two named Cora. Both were born in May 2018.